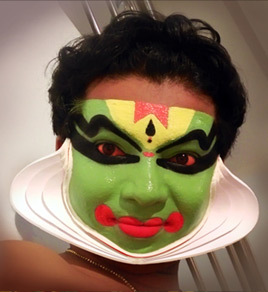 Since time immemorial man has used masks and face paint in theatre, to add an extra dimension to the performance. 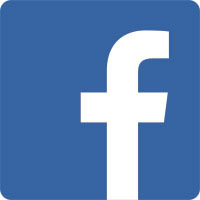 It was often used to define the persona of the character. Sometimes it was used as part of ritualistic worship. It always added an element of the esoteric to what might otherwise be ordinary – even mundane. 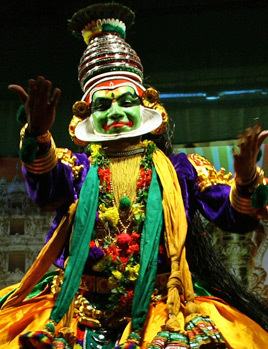 Of all such theatre and ritualistic forms of India perhaps the most complete and most sophisticated is Kathakali, the dance-drama of Kerala. Gods and Heroes and Demons vie upon stage before an audience that suspends its disbelief to be transported to a fantastic world that is as real as it is illusory. Many of the performers of this arcane art have become as legendary as the characters they depict. And a new generation is waiting to step into their shoes. A new generation that has stepped further on the path blazed by their predecessors. More ready to experiment than those who have gone before. Kalamandalam Aravind is an artiste of this new generation who can hold his own among his contemporaries.